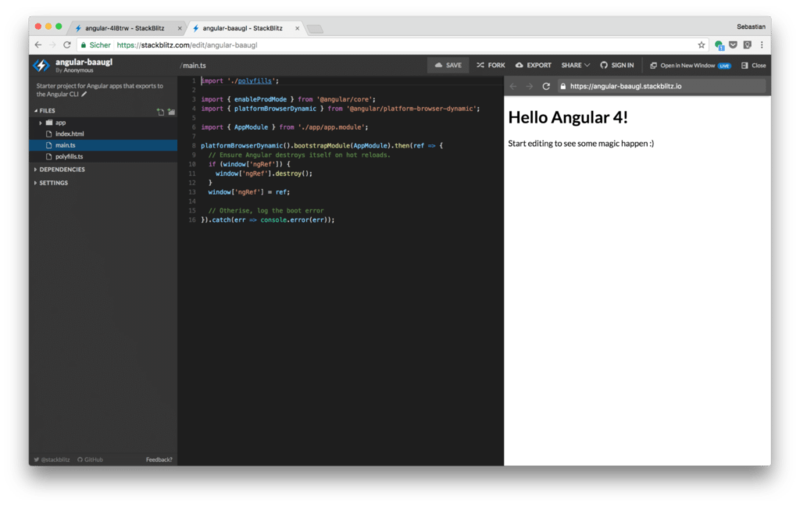 CodingTheSmartWay.com is a blog about latest technologies in web development, including Node.js, Meteor, React and Angular! 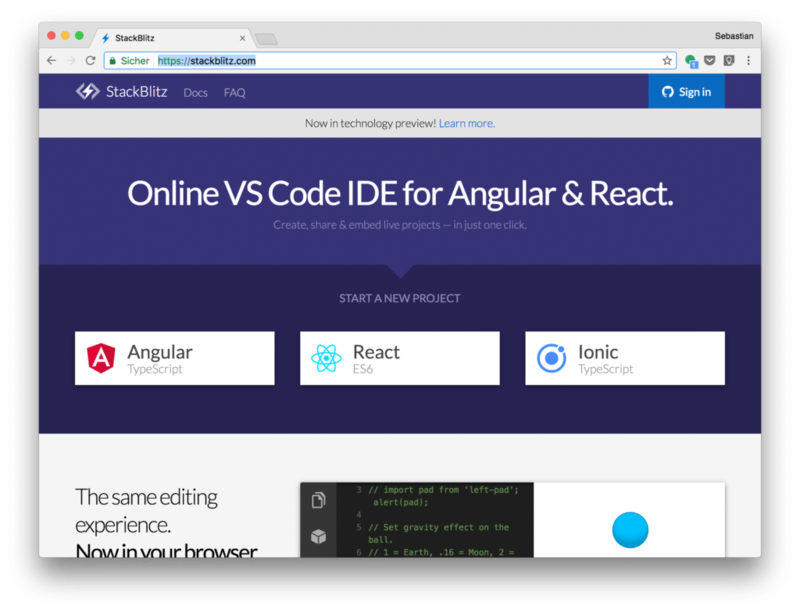 StackBlitz is an online IDE which supports Angular and React development projects out-of-the box. 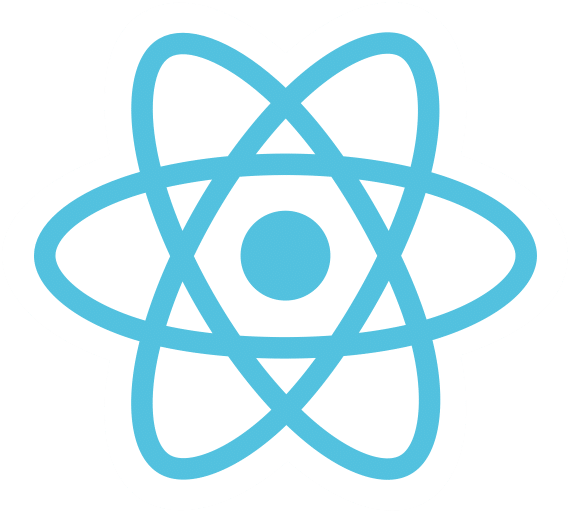 The guys from thinkster.io have created that great project to make it as easy as possible to get started with your Angular or React project without the need to deal with installation of dependencies or create a build configuration. StackBlitz has many great and outstanding features which no other online code editor has to offer at the moment. 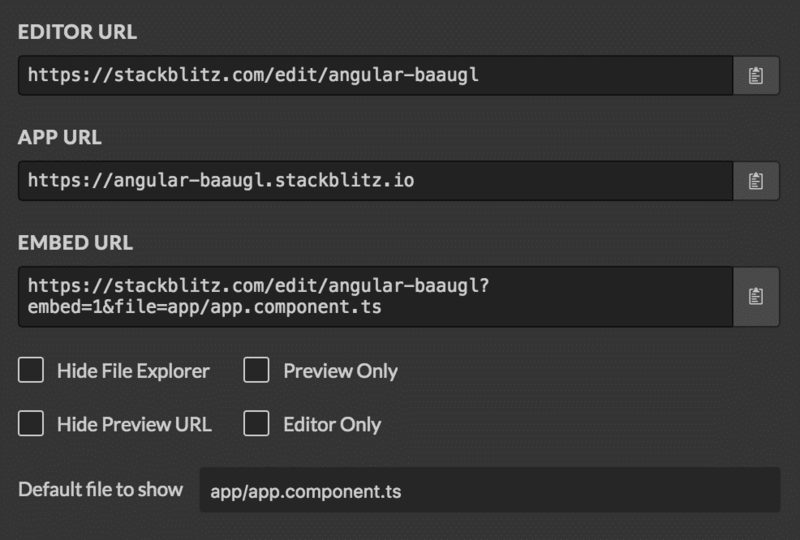 So it’s worth taking a deeper look at StackBlitz and see what this online IDE has to offer. The view is split up into three sections. Files, Dependencies und Settings: On the left side you can find the Files, Dependencies and Settings view. Code Editor: The code editor is placed in the middle of the window. Clicking on one of the files in the project structure on the left opens that file for editing. The editor supports automatic code highlighting and smart completion. Application Preview: The application preview on the right side shows the application’s output in the browser. The preview supports live-reloading. If you change the code in the editor you can see the result on the right side without needing to refresh the view. The browser preview can also be opened in another browser window, so that you can use the browser development tools (e.g. Debugger) without any limitations. 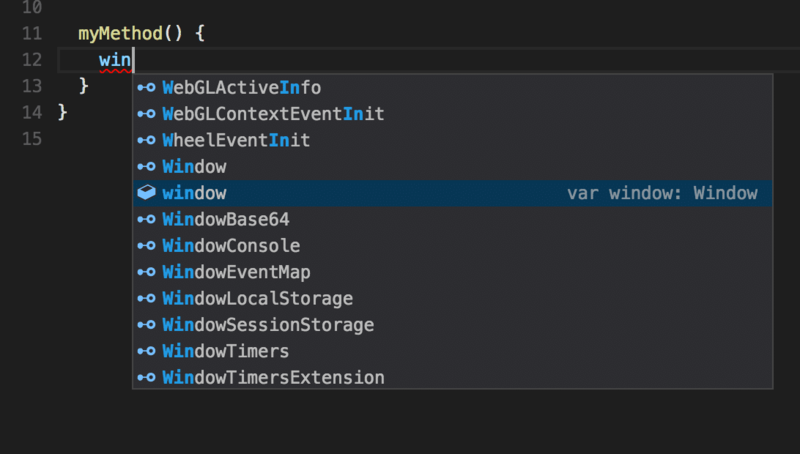 This feature is similar to IntelliSense which is known from Visual Studio Code. Starting typing in keywords or expressions brings up a list with all suggestions. You can select one entry from the list and hit return to complete the code. 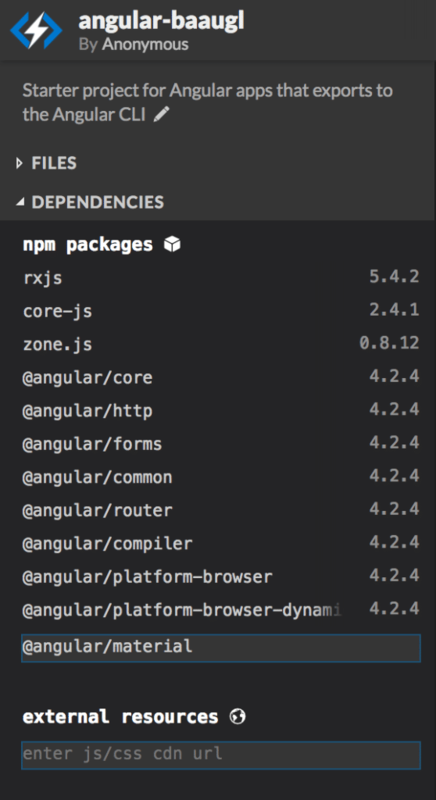 You’ll get a list of already installed NPM packages. An input field is available which can be used to typing in a NPM package name (e.g. @angular/material). Hitting return will automatically install that dependency. Clicking on button INSTALL MISSING DEPENDENCIES will add those libraries as well. Another very cool feature is: If you paste in existing code into the StackBiz editor, it will automatically detect missing packages. You will be able to install those missing packages by simply clicking on one button. StackBlitz is a Progressive Web App (PWA) which let’s you continue your work even when your network connection is lost. You can still make changes to the project and even the development web server and the live preview will still be available. Once the network connection is back again, everything is synced to the server again without the need to do anything manually. Embed URL: URL which can be used to embed the StackBlitz view in your web site or blog post. With the checkbox elements below you can configure what this embed view will look like. StackBlitz has just been release for the first time and already looks very promising. 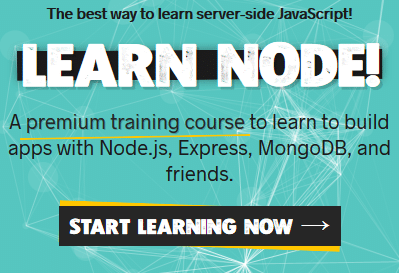 It has lots of cool features which makes developing in the browser a breeze. 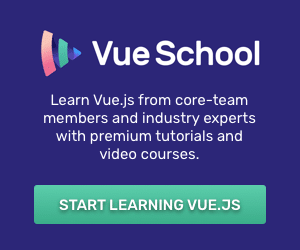 Beside the support of Angular and React the project team has already promised to extend StackBlitz to support Vue.js in the near future. 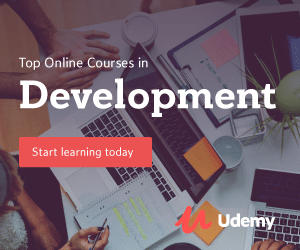 Using and writing about best practices and latest technologies in web design & development is my passion. Copyright © CodingTheSmartWay.com. 2019 • All rights reserved.